A Google offshoot called Dandelion will begin to promote geothermal energy for residential heating and cooling in the NE-United States. Motivation: 39% of CO2 emissions come from buildings, so here is a vast potential to bring these emissions down. “Geothermal” in this context means draining heat from low depths using u-shaped plastic pipes, buried in a back yard and use it as an input for a heat pumps. For this purpose a drilling method was developed to minimize the cost of installing the pipes. Dandelion is seeking to cooperate with specialized installation companies and offer a financial package to homeowners, with monthly expenses lower than the common fossil fuel bill, without a down-payment. Typical cost picture: investment sum $20-25k or $160-180/month over 20 years, substituting $35k of 20 year oil cost and 110 ton CO2. For propane consumers, saving would amount to $63k/130 ton CO2 over 20 years. [treehugger.com] – Dandelion: an audacious and radical geothermal energy startup? 49 companies in the vegetable, plant and flower-growing industry in the Westland area in The Netherlands are drilling for geothermal energy to a depth of four kilometres. The actual first drilling is to be started during Q4-2017 and will last 100 days, just like the second drilling. Activities are mainly carried out by VB Geo Projects, KCA Deutag and Schlumberger. Production of warm water is expected to begin in the Summer of 2018. 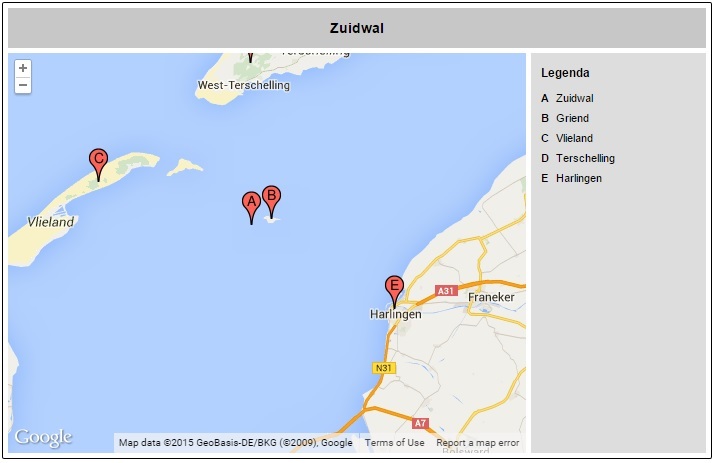 Record drilling depth so far in The Netherlands was 2.5 km. The 49 participating companies have committed themselves to be the customers of the produced warm water. The remarkable growth of geothermal energy in The Netherlands has everything to do with the presence of large-scale greenhouse agriculture, an ideal application for geothermal energy. [source] “Glazen Stad” (Glass Town). the endless green houses behind the dikes and between Rotterdam and The Hague. 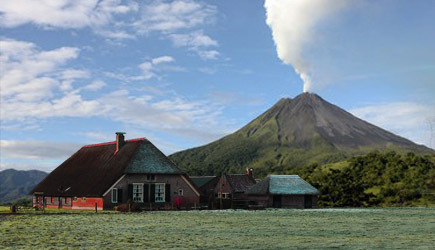 Artist impression of non-existing above-ground Dutch volcano. Until recently the Dutch public was not aware of the fact that The Netherlands harbored a true volcano on it’s territory, or rather under its territory, at a depth of 2 km, which explains this seemingly remarkable geographical ignorance. This could change though as plans have emerged to use geothermal energy from the volcano, at a temperature of 140 degrees Celcius, 30 dgrees more than usual at those depths, to provide energy for the nearby island of Terschelling. According to the plan, Terschelling is to become independent of gas and electricity from the mainland by 2020. Nice animation of how a private garden can be used to extract thermal energy from the soil for space heating purposes. A volcano in Oregon is going to be used in a demonstration project for applying geothermal energy. Steam will be produced at great depths and used to generate electricity. The heat is there, open question though is whether it will be possible to establish a circulation of water in the system. 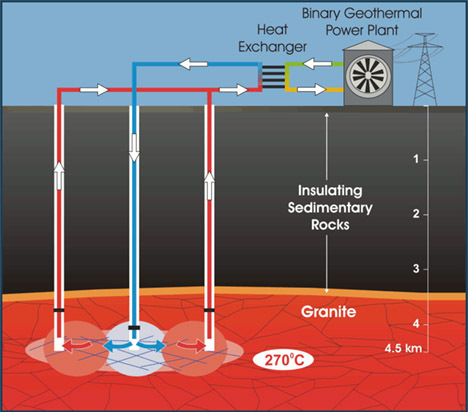 Engineers are working on a new technology called Enhanced Geothermal Systems (EGS). Wells are going to be drilled deep into the rock, water will be pumped in and steam will return. Some concerns regarding artificial earth quakes exist. Additionally it is difficult to scale the technology. Two small EGS plants already exist in Germany and France. Participants are DoE and Google, amongst others. EGS is attractive because it vastly expands the potential for geothermal power. Currently geothermal sources are used to generate 0.3% of the electricity in the US. EGS could bump this to 10% in 50 years time. A 2008 USGS assessment found EGS throughout the West, where hot rocks are closer to the surface than in the East, has the potential to produce half the country’s electricity.